These decals come on a humongous sheet with at least around 500 decals on it. I tried to count but they're not all in straight rows so it was a little difficult. The decals are mostly snowflakes of all different kinds. I used one of each kind in my mani. Assuming I didn't miss any, there are 30 different styles of snowflakes. Plus some presents, a few reindeer and cupids, and some stars, holy, and snowmen. There are just a bunch of decals to choose from and they're only $2.99 USD!! It's actually 11 different "sheets" in one. The decals were very easy to work with. I dunked them in water for about 10 seconds and they slid right off the backing with no issues. The decals are on a clear sort of backing or outlining so you can put them over anything and all you see is the snowflake. Plus they are opaque enough to even cover darker colors completely, while still being super thin and manageable! One of the things I love about these decals is the variety. Every snowflake is unique, so they say. So I love being able to have no two snowflakes alike on my nails! The base I used for this mani is a drag marble of China Glaze For Audrey, Zoya Breezi, and an unnamed blue Bellatrix polish. 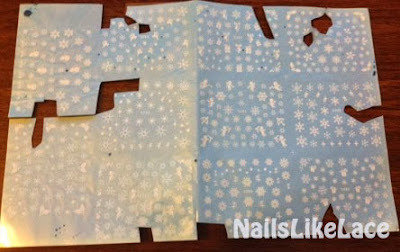 After my snowflakes dried, I encapsulated them with two coats of Seche Vite. When you apply the first coat of topcoat, it is just like with stamping or acrylic paint work, you have to be light handed and careful because, like with any water decals, the topcoat melts the decals and merges them into the polish, so it can smear and smudge them if you don't have enough polish on the brush, press too hard with the brush, or use a lot of brush strokes when applying the initial coat. I probably could have left mine alone with one coat of Seche, but a few decals were hanging off the edge, so I wanted to apply my first coat of topcoat and let it melt the decals because it will melt what's on the nail, and leave what's hanging off so once the topcoat is dry, you can just wipe away the leftover decal without having to worry about trimming them. You do have to wait until the nails are dry though. If you apply your topcoat and immediately try to remove the excess decal, the topcoat will have started to soften the part of the decal that is stuck down, and pulling at the excess with distort what is on the nail. You can kind of see what I mean on the lower left corner of my middle nail. I didn't let my topcoat dry before trying to remove the part of the decal that was hanging over my nail, so it pulled the whole snowflake apart. Since the part on my nail was already starting to be softened by the topcoat, it just ruined it instead of letting it slide around like it did pre-tc. Make sense? If you want to do snowflakes nails but can't hand paint them, and don't want to stamp them and have quadruplet snowflakes, I highly recommend these! They are quick and easy and look beautiful! 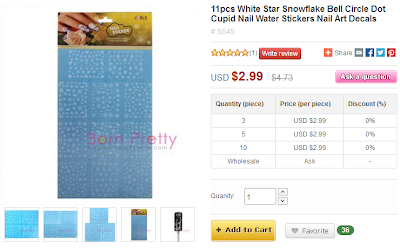 If you love doing snowflake nails in the winter time, you need these. They are a perfect size even for my nubby nails. 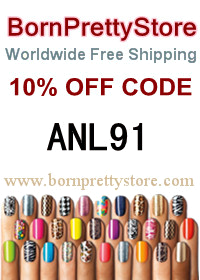 You have so many different styles to choose from and plenty to last for probably 50 manicures! That's my rough estimate. There's about 50ish decals in each section. Normally I would only use 2-3 per nail, even just 1 on some, but I wanted to show all the different types. So if you average that out, that could be about 20-30 manis for me. For $3. I love it! If you would like to pick up some of these decals, or anything else from Born Pretty Store, don't forget you can use my coupon code ANL91 and you'll get an additional 10% off your order (plus free shipping)! This product was sent to me for my honest review from bornprettystore.com. All opinions are my own.